ADVISORS with Purpose™ has accumulated a collection of stories, books, articles and downloads that we feel can effectively help others to know more about Biblical stewardship. Our prayer is that you will be blessed by exploring the offerings below and that you will discover something that will assist you in your own unique situation. Common questions - These are some common questions we are asked regarding stewardship and giving. 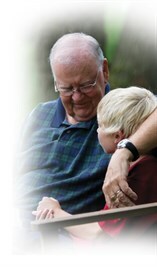 Articles - This collection of articles offers many thoughts on stewardship and giving. You may find something that relates to your own personal financial situation and desires. Stories - Follow the life journey of a fictitious senior man who is learning much about Planned Giving through his own personal life experiences. Your life journey may be reflected in his at certain times, so browse through these stories looking for nuggets of wisdom that could be effective in your own life. Helpful Websites - ADVISORS with Purpose™ enjoys a wonderful relationship with many other Christian organizations that are built upon the same solid Christian principles.